#Vanlife: Why You Should Definitely Buy That Camper Van. This is not a litany of perfect #vanlife photos or a list of warnings on the dangers and inconveniences of van life (living full-time out of a van). There are plenty of articles and Instagram posts already out there if that’s what you’re looking for. 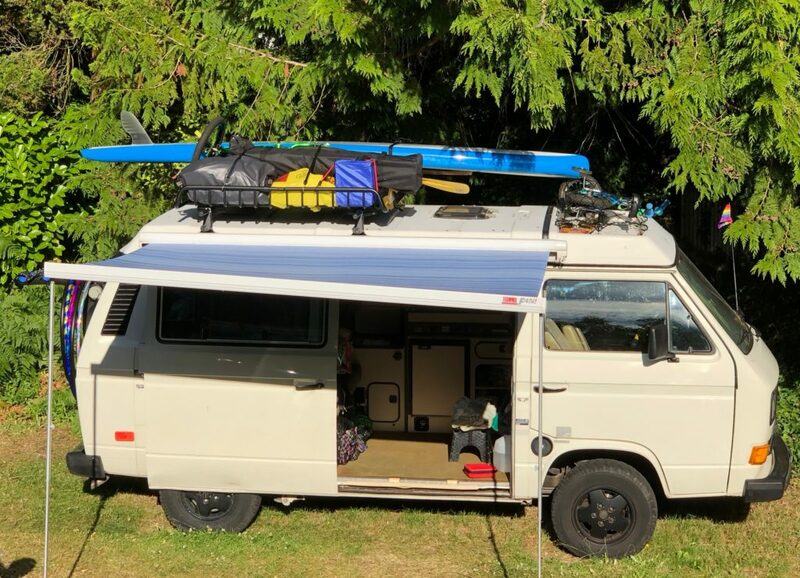 What I’m here to talk about is the freedom and the possibilities you can find with a camper van without selling your belongings, subletting your lease and living full time out of a van. 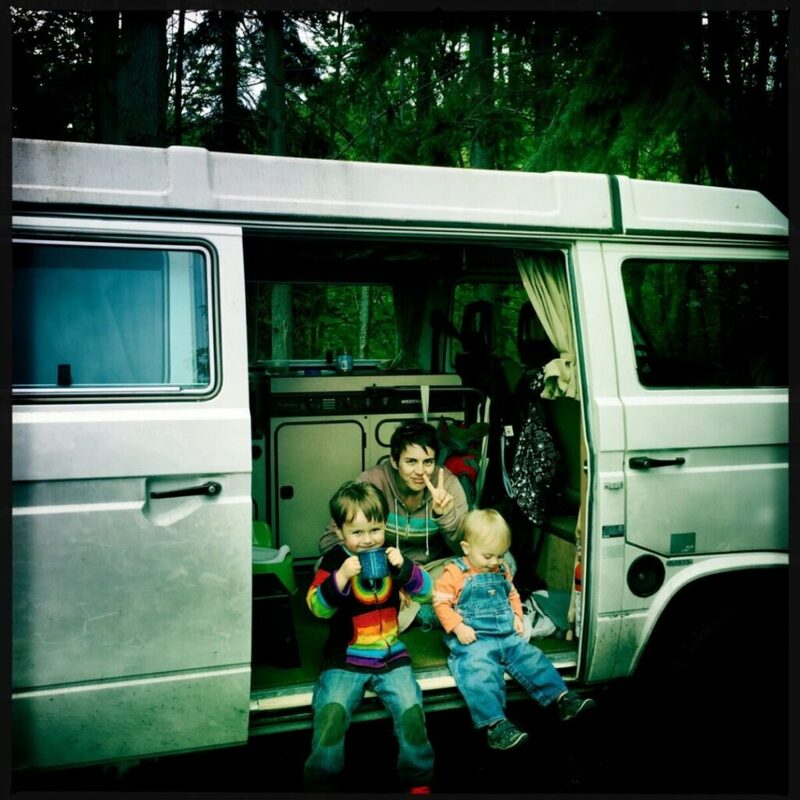 My husband and I purchased a camper van when our oldest son was about 1 year old. My reasoning went like this: I wanted to take my kid(s) camping. 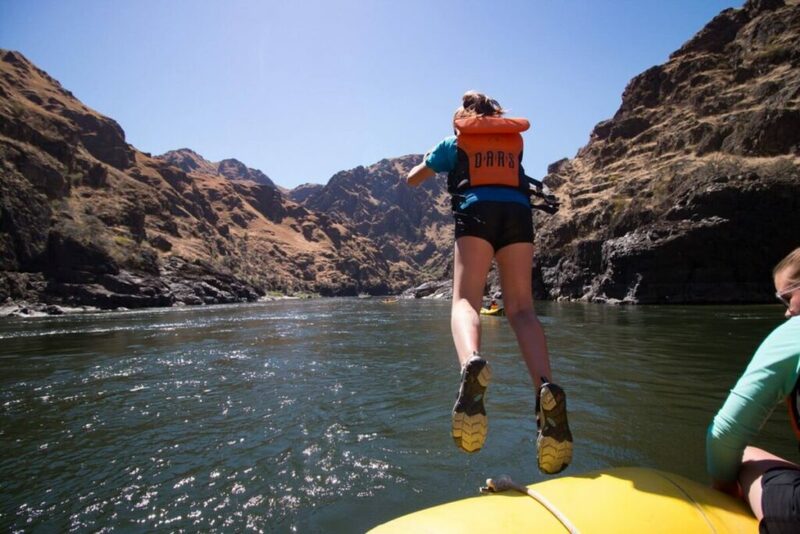 I’m not a rabid camper/outdoorswoman, but I’ve done a fair amount of camping in my day and I knew this (among other adventures) was something I would want to share with my kids. More importantly, though, I am a huge proponent of road trips and, having road-tripped in a variety of vehicles over the years, my mom-senses told me that a roomy camper van would equate to a more pleasurable driving experiences for everyone involved. I didn’t know how right I was. As for the camping aspect, I knew that if it meant setting up a tent while trying to supervise/cajole young children into helping, and then packing it all back up again, it simply would not happen. Not for me. As I said, I’ve done my fair share of camping and, while I love a good long hike, I do not enjoy sleeping on the ground or the whole tent process, and I cannot imagine enjoying it with small children. That’s just me. Knowing that about myself, I decided a self-contained camper would make things easier. Who doesn’t want easier with children? This, coupled with a heaping helping of nostalgia and a deep-set love of the classic VW bus, sent me straight to Craigslist. A few short weeks later, I had the keys to our ’86 VW Westfalia camper. One bench seat that pulls out into a bed, fold-out loft bed with pop-up tent, two-burner gas stove, (marginally working) fridge, and so much room! That was 7 years ago and, though we’ve done a number of expected repairs and several spendy upgrades, I’ve never regretted that purchase. I honestly call her the single best parenting purchase we’ve ever made. 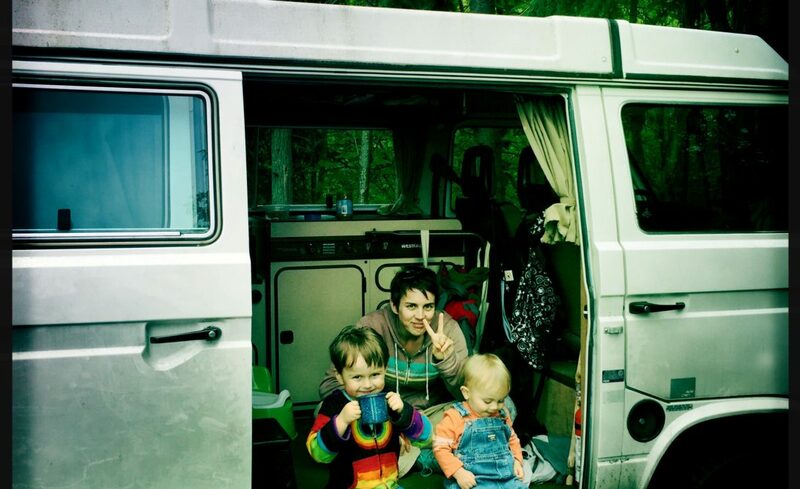 Buying a 30-year-old van for a growing family can seem daunting and even irresponsible. What if it breaks down? Won’t it be a money sink? Do you need to know how to fix it yourself? How can you feel safe with your kids in such an old car? It doesn’t have airbags, anti-lock brakes, etc, etc! Well, yes and no. There are several new camper-van options with all the safety and technological upgrades. For some of us, the price and nostalgic romance of the old ones weigh heavily in the decision. You be your own judge. For me, the choice was easy. The first car I can remember my parents having was a bug. My first car was a ‘71 VW Type 3, and in my 20’s my boyfriend and I had a ‘79 VW bus. The smell, feel and sound of an old VW pulls hard at my heart. I will say, though, that the new vans out there are pretty plush! I know what else you may be thinking; I can’t afford a separate vehicle just for camping! Can a camper van really replace my daily driver? The short answer is yes. Roughly the same size as a minivan, they can be parked almost anywhere. Most wheelbases are comparable to average vehicle lengths but height can vary greatly with make and models currently available. Those Mercedes Sprinters are amazing inside but they are huge and in no way will you be taking that into the parking garage at Target. Full disclosure: my ‘86 VW is not currently my daily driver. I have an electric car that I rely on for daily commuting and kid-activity shuffling, but at one point it was our only vehicle and served us perfectly well. I know the #vanlife fantasy is about freedom. The freedom to sell most of your stuff, quit your day job, stop paying rent, and travel around the continent footloose and fancy-free. A lovely dream but impractical for the vast majority of us – especially if you already have kids. I’ll let you in on a secret though: I may not do as much camping in my campervan as I want to, but I have discovered amazing little freedoms within my daily grind that would never happen in a compact car. 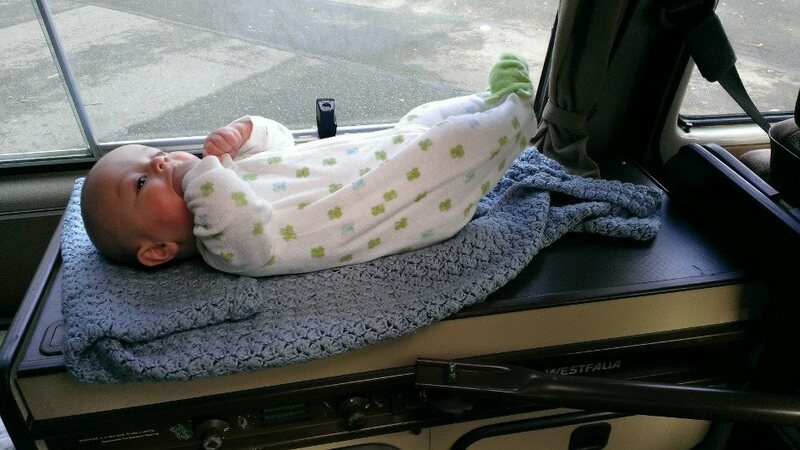 I’ve had the freedom to comfortably nurse my baby on the spacious bench seat, with or without curtains drawn for privacy. I’ve napped in the loft tent while my baby kept sleeping in his car seat below me – in my driveway, outside my older son’s preschool, at a park. Another baby bonus: the covered stove makes a terrific changing station! I’ve arrived a bit early between work and school pick-up, and taken the time to make myself a bowl of ramen and a cup of tea while I wait for my son. And making hot chocolate for four or five kids after a damp, blustery park outing, from inside your van? Cool Mom status solidified! Frankly, I don’t know why a roomy van with a fridge, stove and unbelievable storage isn’t the standard for family cars. But don’t take my word for it. My kids will gladly tell you why they love her. Me? I love that I can always have spare clothes and extra snacks tucked away in cabinets, making spur-of-the-moment day trips so easy. I love that everyone has enough personal space to not immediately annoy each other the moment we get on the road. Mostly, I love the memories my family is making with our day trips, weekenders, and week-long camping trips in our old campervan. Eli Edlund is a stay-at-home mom of two young kids, a part-time veterinary assistant, and volunteers at a wildlife hospital. She loves hiking and will jump at the chance for a good road trip. In her spare time, Eli enjoys learning new languages and playing roller derby. She lives in Seattle WA. What a lovely article. We bought our 83 Westie last August, and I’ve already experienced much as you have, with exceptions of hot 🍫! I must steal that one. We turned ours into a lemonade stand and a holiday decoration stand. The kids at my daughter’s school love it when Poppy and I drive round the school circle. They are such a cute, compact camper. Great for a daily drive too, easy to park. However stick shift and no power steering are testing at times! This is awesome! There are so many voices bringing light to the minimalist life of selling all possessions, quitting one’s job and taking off for world travel on the road. While these stories are inspiring on the one hand, it’s almost immediately a reminder of the limitations of parenthood. I hope more stories like this are shared to give an example of how parents can wrap up those dreams of freedom into a practical outlet that’s also great for the kiddo’s.